On the morning of 19 July 1984, a large number of shop workers at the Henry Street branch of Dunnes Stores in Dublin refused to register the sale of South African fruit. They were immediately suspended by the management and so walked out and took up positions outside the main entrance. However during the day, with the realisation that their actions might lead to the loss of their jobs, many drifted back to work so by the evening only nine remained; eight women and one man. So began an industrial action that would last for over two years, become a cause célèbre amongst the Irish Left (I can personally recall the pickets and solidarity demonstrations outside the store) and garner much international recognition and sympathy. From a socialist perspective it revealed the aggressive and uncompromising nature of certain individual capitalists to maximise profit and the weak and ineffectual response of government; torn between wanting to do what was ‘right’ and indeed popular with the public and the hard-nosed need not to disrupt the operation of capitalism. 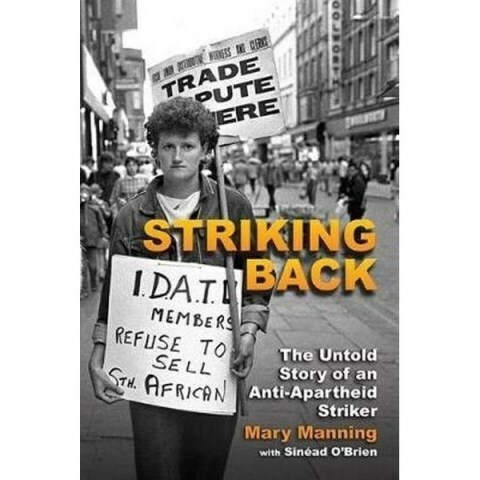 This story is told in a memoir, Striking Back, published last year by one of the leading strike members, Mary Manning. The strike took place in an Ireland that was quite different from that of today. It would be hard to underestimate the political power that the Dunnes Stores organisation, headed up by the pugnacious Ben Dunne, wielded at the time. They were by far the dominant retail organisation in the country facing little real competition from any major rival (this was long before Lidl, Aldi, Tesco etc. entered the Irish market in a serious way). The Dunne family cultivated strong links with the upper echelons of both centre-right parties in Ireland, Fianna Fail and Fine Gael. Subsequent tribunals of enquiry (prompted by other public matters) revealed how nakedly and directly this influence was wielded in terms of payments to parties and politicians in return for favours or ‘considerations’. For workers, Dunnes had a well-deserved reputation for being an extremely hierarchical, top-down organisation where successful shop managers were judged by higher management as to how efficiently they worked those at the shop floor. Furthermore Ireland was a much poorer country then than it is now and full-time jobs were very scarce so employment in any large company, even in a firm with a reputation of Dunnes Stores, would have been very desirable. It took tremendous courage for Mary and her colleagues to go out on strike and then to persevere for so long. As she says, they were all working class women with no higher education qualifications and limited employment possibilities. The origins of the strike are interesting and explain many of the difficulties that the strikers experienced. The retail workers were members of the IDATU trade union (which has subsequently become part of the MANDATE trade union). Historically it was very much one of those small ‘bread and butter issues’ organisations solely focussing on the day to day employment of its members without any real interest in the broader interests of the working class in society. Then a young, radical individual, John Mitchell, who had been involved in the Irish Anti-Apartheid Movement, became General Secretary and persuaded the union to endorse resolutions condemning apartheid and specifically directing its members not to handle South African products in their places of employment. His fellow members of the union Executive went along with this, content that this support was meant to be solely rhetorical and probably in their minds indulging his whimsies. Once the strike started and then continued for such a prolonged period, they became more reluctant to authorise the £21 per week strike pay. To be fair, they were probably more representative of the wider membership of the union. The book discusses how in fact only a small number of the union members in the particular shop on Henry Street went out on strike in line with official union policy and none of the union members in all the other stores throughout Ireland joined them until near the very end. Understandably for many of them, the issues in South Africa must have appeared remote and the personal costs of striking disproportionate to any small improvements that might have resulted to the lives of black South Africans. In fact not only were many Dunnes workers indifferent to the cause of the strikers, but as Mary discusses candidly, what she found upsetting was the hostility they experienced from some of their fellow workers who remained inside. In addition to the union, the strike proved something of a quandary for the Irish Labour Party. As with many organisations that identified with the ‘Left’ they claimed to abhor apartheid and indeed the vast majority of their members surely did. The party formed part of the Irish government at the time and so theoretically at least could have aided the strikers in a meaningful fashion. Some of the senior Labour figures holding full cabinet positions were outspoken in their opposition to apartheid. However, their party was the junior partner with the much larger and more conservative Fine Gael party. Government ministers of that party felt they could not intervene in the action. Their opposition to intervention was either for the ideological reasons of not interfering in the operation of the ‘free market’ or for more pragmatic reasons of trade and employment. Ireland exported more to South Africa than it imported and South Africa had invested in some industrial plants in Ireland. The government was afraid of retaliatory action from Pretoria if they became involved and the harm the loss of trade with South Africa would do to an already fragile economy here. So Labour ended up being sympathetic to the strike while simultaneously being embarrassed by it because of their inaction. It’s another small example of how reformist parties find it difficult to deliver even minor actions when in a capitalist government. The striking women also sought the support of the Catholic Church, still a powerful institution at that time, in their quest to obtain a successful outcome to their struggle. They wrote to Bishop Eamonn Casey who by the standards of the time was regarded as a liberal, people-oriented, member of the Catholic hierarchy with a particular interest (and to be fair a decent track record) in issues of overseas justice. His (private) response proved a particular disappointment where he described their request for his support as ‘impertinent’ and their actions as potentially damaging to black South Africans. Probably the main reason for his dismissal of their cause was that while the Church liked to be involved with progressive issues, it was only when they were in control and when the Church itself would be the ultimate beneficiary of any campaigning action. Most curiously the book also highlights the ambivalent attitude of the Irish Anti-Apartheid Movement itself to the strike. Initially they gave it their full support but then their leader Kadar Asmal (later a minister in the first post-apartheid government) privately withdrew his support for reasons not clarified in the book. It is suggested that the Movement was becoming alarmed at the radical nature of the protest and how they were afraid it might damage their coalition-building efforts with more mainstream politicians and governments against apartheid. The strikers did receive wholehearted support from Bishop Desmond Tutu who invited them to South Africa to witness the plight of the population first hand although when their plane arrived at Johannesburg, they were refused entry and after a short detention sent home. The strike at the store lasted for over two years primarily down to the stubbornness of Ben Dunne in refusing any sort of meaningful compromise and insisting to the end that workers in his stores ‘do as they were told’ without any question or debate. He claimed it was management’s sole right to decide what the store did or didn’t stock and made it a principle not to yield to the workers’ ethical reservations. At the time, the other supermarket shops and outlets in Ireland also stocked South African produce but usually the issue was finessed at a local level by allowing staff not to handle the goods if they had moral scruples about it. The strike formally ended towards the end of 1986 in a rather messy fashion though with the strikers ultimately vindicated. Embarrassed by the international publicity and support the strike was garnering, the Irish government finally stepped in and banned the importation and sale of all South African goods from 1987 onwards (one of the first countries to do so). In principle the strikers were free to return to work at Dunnes Stores. Clearly the company didn’t want them back, considering them as troublemakers but they were legally obliged to take them. Some of the strikers did not go back knowing full well the poisonous atmosphere that would await. Some did, including Mary herself, but the company resorted to underhand low-level intimidation in a bid to force them to resign. Within a year Mary felt she had to leave and feeling that her prospects in Dublin would be very limited due to her profile as an ‘agitator’ she decided to emigrate to Australia for a number of years. s an epilogue, the strikers finally managed to collectively visit South Africa in 2013 for Nelson Mandela’s official funeral which on a personal level was a thrilling emotional experience, though Mary is realistic enough to comment that for many South Africans living in the townships very little substantial change has taken place since the fall of apartheid. Overall this is an interesting account of genuine working-class history conveying the complexity that is involved when individuals become politicised while simultaneously dealing with the threads of family life, personal relationships and hopes for the future. The book highlights the heavy price that workers can pay when taking political action against powerful interests. It also demonstrates the relatively weak position of a small group of people taking political action without broad support showing that real and substantial changes do need the committed involvement of the majority of the population.